A few years ago, I created a blog post on using View Representations in Autodesk Inventor. But this holiday weekend, I thought it might be worth redoing. After all, I'm starting to get the hang of these videos! (at least I think so). You can see that text only post HERE. I also think that it's one of those things that is pretty useful, and is worth revisiting from time to time! So what is it that View Representations do that I think makes them so useful? 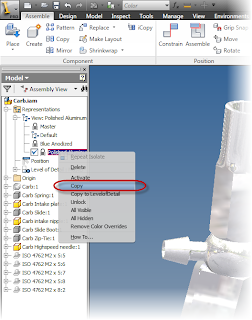 This can come in real handy when you need to represent components with different finishes, turn off several components repeatedly, or look at an assembly from a specific angle. For example, I've often used to "omit components for clarity". That condition that some parts must be hidden to show other parts underneath. Particularly when I was working on some pretty complicated electronic enclosures a while back. Uses for View Representations are many. There are those who probably won't use them. It's a slick tool, but as with every tool, not everyone has a use for them. But there are also bound to be those who as; "Where have you been?" So here's the video. Take a look, and decide for yourself! Happy Holidays as we say our goodbyes to 2011, and head for 2012! And for one more tip! Check out the right click menu! You have more options that just creating View Representations! One I like is Copy. If you need to create a new View Rep that's almost like one you already have, then just copy it, and make the changes! Copy to Reuse a View Representation! If you've been following my blog, you may have noticed that I've slacked a bit on posting. 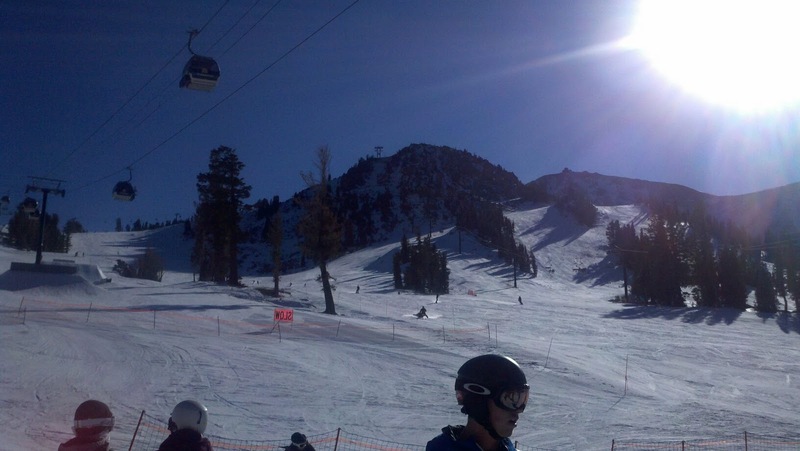 It's been a busy week of a business trip to Mexico for a day, a lot of demo prepping and installations as the year comes to a close, and a short vacation to Mammoth to catch my breath from it all. But that doesn't mean that the lessons haven't stopped. A couple of weeks ago, I ran into an issue caused by a demon I thought had finally gone a way. 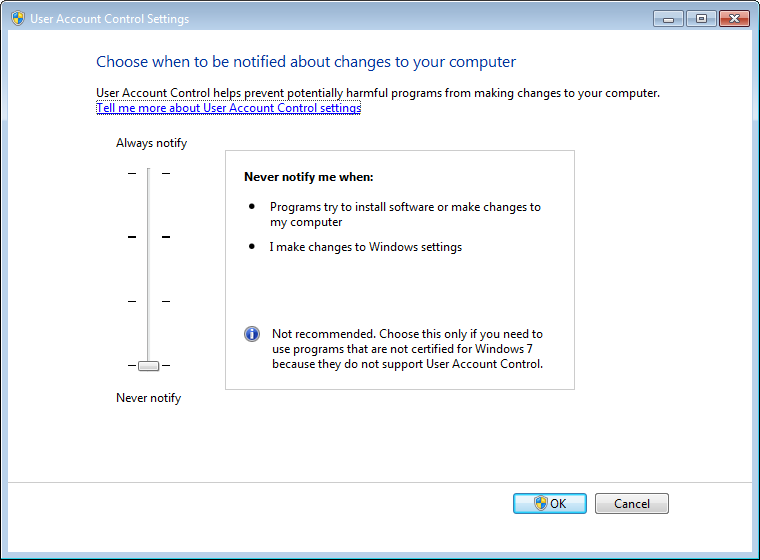 User Account Control (UAC). 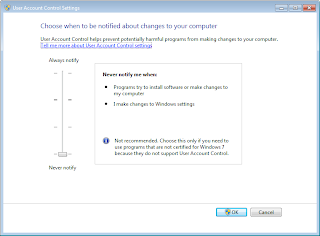 Found in Windows Vista and Windows 7, it helps secure your system against unauthorized changes. It's quite effective. As a matter of fact, it's so effective, it can prevent programs you need to change your system from doing so, rendering that program unable to do important operations. In recent years and software releases, the issue has gone away as Microsoft, and the programs that installed on it, have learned to coexist much more efficiently. 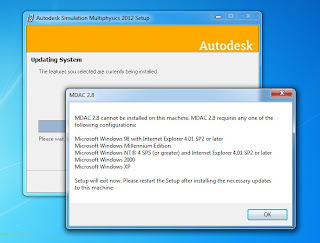 But recently, that little monster reared up again with an installation of Autodesk Simulation Multiphysics 2012 Service Pack 1 on Windows 7. I received a tech call where a user was getting a cryptic MDAC error. It was pretty cryptic, and definitely a little frightening. Here's the error, but what does it mean? It didn't indicate what the error was at all, but once we had eliminated things like the user having appropriate privileges, virus scanners were off, etc. I remembered one thing. "UAC used to cause wacky things like this...."
So we went into the control panel, and turned off UAC. In Windows 7, pull the slider to the bottom! Sure enough. Once that was done, the install went through seamlessly. Gone away the issues of UAC? Not just yet! If it's up to me, I turn if off. If you ask what I think about you running it? See the part where I turned it off. Does that mean that you're going to encounter issues if you leave it on? Not necessarily, but keep in mind that it can still cause issues (as experience taught me). 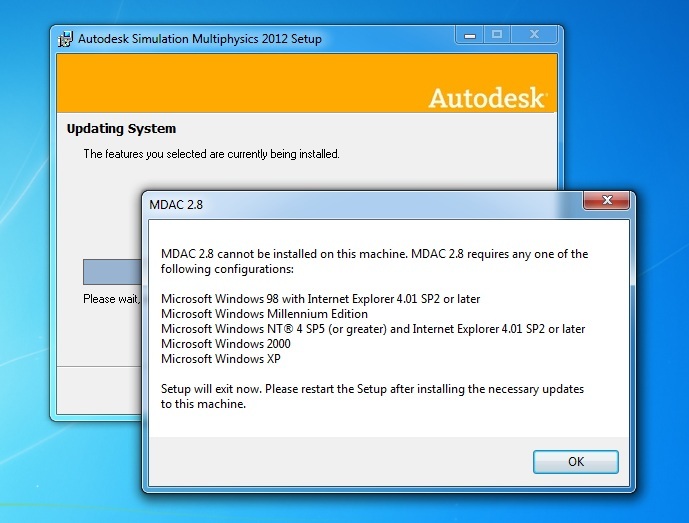 So if a program or service pack won't install. Or if a program doesn't start, it's worth taking a look at UAC. IF at all possible, shut if off, if only to eliminate it as a culprit. It can save a headache or two! And if you want more info on turning off UAC, there's a KETIV Tech Tip! Note that the tip is for Windows Vista, but Windows 7 is very similar. 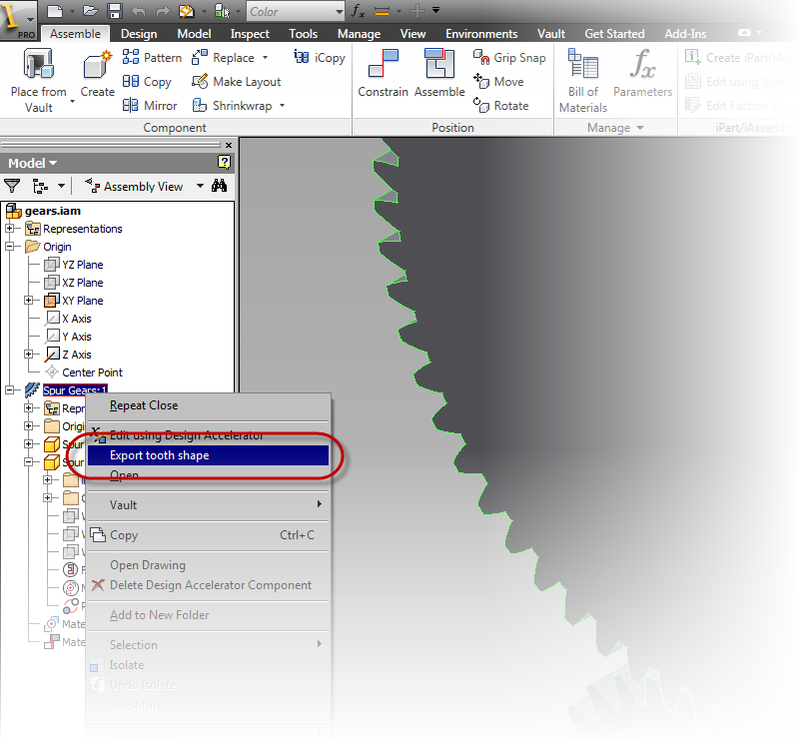 Earlier this week, I was asked, "How do you export accurate spur gear geometry from Autodesk Inventor's Design Accelerator." I found myself frustrated. Why? Because I used to know exactly where it was, but it had been years since I'd be asked about it! In that time, it had faded into the shadows of time. 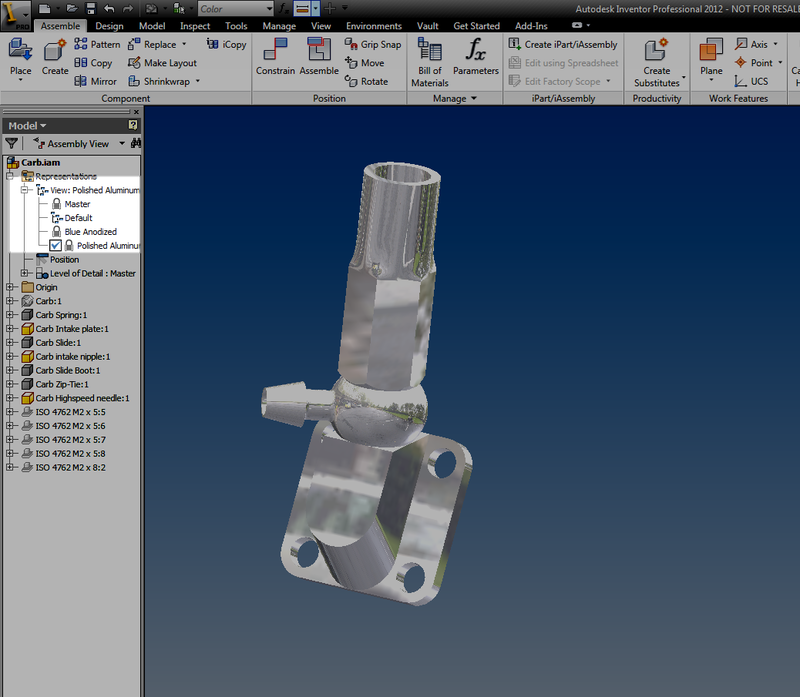 Before I get too far along, I should make some distinctions about how Inventor creates gear geometry. These are things I've picked up in my "sojourn through technology." The gears "as generated" from Design Accelerator are approximations. If you zoom into the tooth profiles, their not the precise involute profiles that "proper gears" have. Now that there's been a collective gasp of horror from the internet, don't fret! 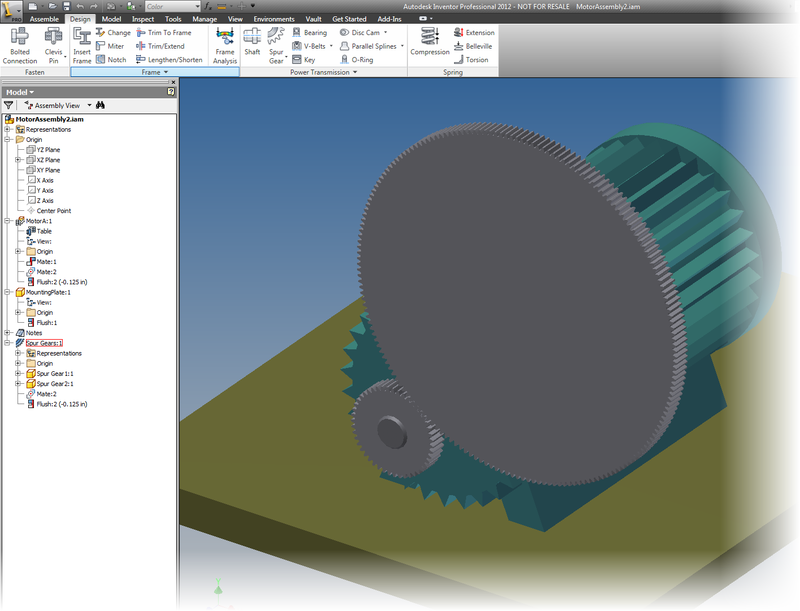 For the purposes of laying out and specifying which gears to use, the gears as generated work just fine. Critical items like ratios and center distances are accurate in this form. But what if you want to make the gear? Especially if you're running a test where you may make the gears in a rapid prototyping machine? This is where exporting the accurate tooth geometry becomes important. Now back to me scratching my head, trying to remember where I left that "Export Tooth Geometry" button! So I hunted and conducted internet searches. And low and behold! I found it again! 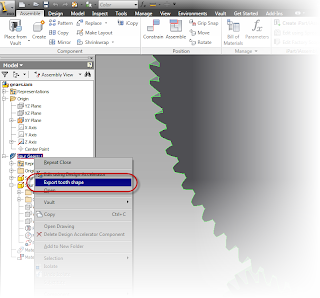 All I had to do was right click on the "Spur Gears" icon in the browser! There it is! Right click on the Design Acclerator icon! Now that I've found it, I told myself I'd commit it to memory better this time. And what better way to do it, than to create a video, blog it, and share it amongst cyber space! Not to mention there may be those who like myself, have wondered if this is possible as well. Perhaps they gave up searching for it, thinking that it doesn't exist. Well it does! So here's a video to show how it's done!